Did anyone else get this? What is it? I've only seen that in the 2014 Moto X. Is it in the 2013 model for voice? Either way, why would you revert it? I have not seen that. Very weird. That's why I'm asking. It was odd, the phone did a semi-reboot while I was in the middle of composing a text. I say "semi-reboot" because the boot animation wasn't complete then I got a black screen. When I was finally able to interact with it again, it was as if the phone had rebooted and then I had this notification. Wow, that is weird. I've definitely not seen nor heard of that... Following this thread for sure. Found a post in the Motorola support forums that didn't show when I searched before. People there said they rebooted the phone and it went away, and the one that DID uninstall it said he had to do a factory reset to get the phone working right again. 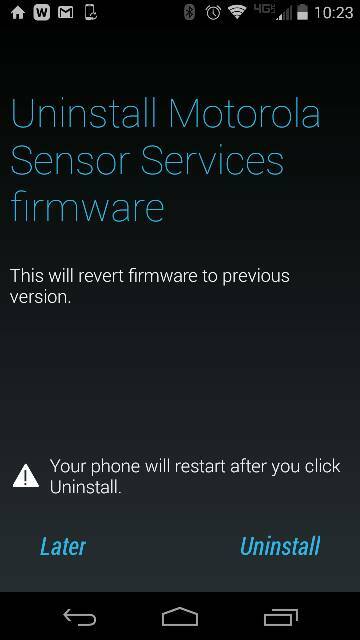 This "uninstall motorola sensor services firmware" notification popped up on my Moto X today. Anybody else seeing it? I did nothing but turned my phone off then back on. No more post!! Motorola stock camera or Google Camera?